Ethel Armstrong, 87, who was a nurse cadet on the first day of the NHS in 1948, today received an MBE from HRH The Prince of Wales. Ethel was recognised in the Queen’s New Year Honours for her seven decades of dedicated service to the NHS workforce and for her involvement in the NHS retirement charity. Ethel was working as a cadet nurse on the day the NHS was established in July 1948. She went on to work in various parts of the country, mainly in radiography and radiotherapy roles, including for the Breast Screening Service in Liverpool ahead of her retirement in 1987. 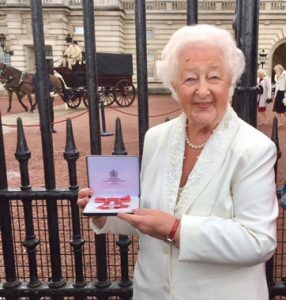 Ethel Armstrong MBE said: “I am completely bowled over to have been recognised by Her Majesty the Queen for my work for the NHS. I never expected to receive such a prestigious accolade for doing something I love. After retirement, Ethel joined the Durham branch of the NHS Retirement Fellowship and quickly became an integral part of the branch. She served as welfare officer in 1992 before becoming Chairman in 1994 – a position she still holds. In 2005, Ethel was elected as the regional representative for the North East and became part of the National Council. She was elected vice-Chairman in 2009, Chairman in 2011 and President in 2013 and from 2015 is a life Patron.